June 17 - 22, 2018. Registration on Sunday 17 afternoon, beginning of the summer school on Monday 18 morning, end of the summer school on Friday 22 afternoon (around 5 pm). We recommend to stay the week-end to visit the beautiful town of Lyon. For those who want to submit a poster (not compulsory) summarizing their work, please send a one-page abstract (as attachment to aline.auroux@ircelyon.univ-lyon1.fr) with the Title, Authors name, affiliations, email address of the presenter, summary of the work and references preferably in Word format, Times New Roman 11. The posters (A0 or A1) will be on display the whole week in Jean Bosco Center. (We cannot print your poster on site). The list of posters and abstracts will be given to every participant. Deadline for poster submission: June 4, 2018. Rooms in "Jean Bosco" center: single and double rooms with private shower and toilets are available (please give your preference on the registration form). Rooms in Foyer Jésus-Marie: located 100 meters from "Jean Bosco" center, single rooms with shared shower (one for 2 rooms) are available. Single rooms with private shower are also available . Other hotels: a list of low price hotels is available below. Note that Jean Bosco center and Foyer Jésus-Marie are very close to each other (less than 100m). The number of rooms in Jean Bosco and Foyer Jésus-Marie is limited. travel time: 2 minutes; every 5 to 10 minutes, from 6am to 10pm, every day. travel time: 3 minutes; every 5 to 10 minutes, from 5:30am to 0am (midnight), every day. A network of freeways connects Lyon to all the major cities of France and Europe. See the detailed map above. Free parking is available at the Symposium site. Lyon main train station, Lyon Part-Dieu, is connected to the major cities of France and to neighbouring european countries. Fast trains (TGV) are scheduled every hour between Lyon and Paris (Paris-gare de Lyon), and six times per day from Paris airport (Roissy-Charles de Gaulle) or Brussels. For train timetables and reservations, please visit the SNCF website. Lyon-Saint Exupery airport is connected by direct flights to Paris and most European capitals. The school site is a 45 min drive from the airport by car or taxi (50 euros). Transportation by fast tramway (Rhônexpress) is available very frequently (see below). Exit on Vaulx-en-Velin La Soie station, and connect to subway A, direction Bellecour-Perrache. Exit on Bellecour station, and connect to subway line D, direction Vieux-Lyon / Gare de Vaise, and reach Vieux-Lyon station. Connect to Funiculaire, direction Fourvière (and not Funiculaire St Just). The Jean Bosco center is located 100 meters from the Fourvière station. The trip from the airport takes at least 1 hour by public transportation. Genève airport, connected to all major world cities, is also less than 2 hours away by car drive or train ride. Maps and timetables of bus and subway lines are available on the TCL website. The same ticket is valid during 1 hour for bus, tramway, metro and incline. For other information, please visit Lyon, City Guide. 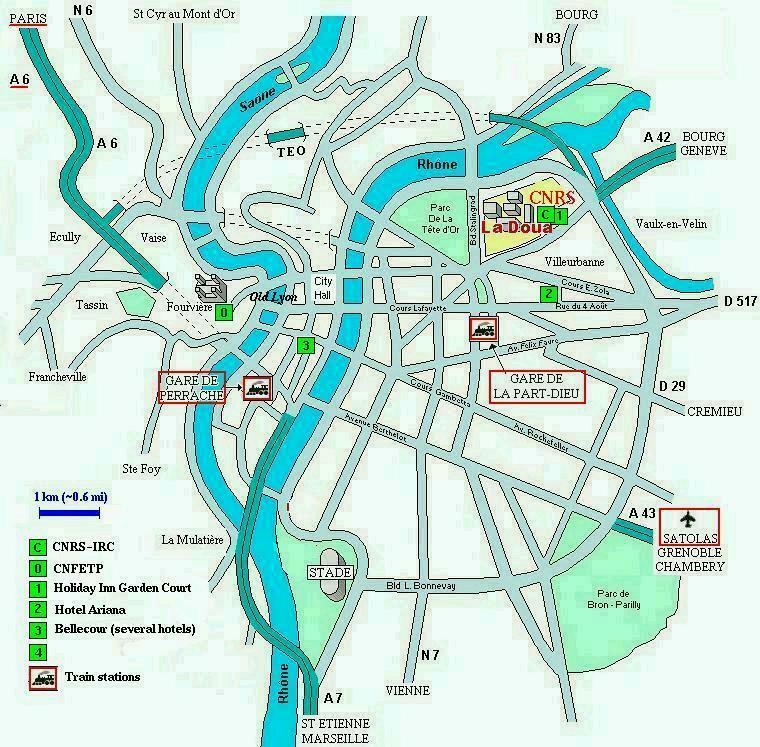 The following hotels are in a very scenic location near the historical centre of Lyon and are easily accessed by public transportation (bus and subway). For other information, please visit Lyon - Hôtels.